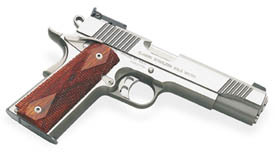 Custom Classic (1997) – around 15K rounds. This started out jamming a lot. Over time it did break in, but it always jammed more than I was comfortable with. This seemed independent of slide releases, magazines, or ammo. I finally decided I could not get enough in trade for it, so I made a project gun out of it. It is currently being fitted with a ramped bull barrel (which won’t load SWC yet – but I won’t blame that on Kimber). I suspect an overly tight barrel was the cause of many of my problems – but no proof. Compact Custom (1998) – around 10K rounds. I LOVE this gun. 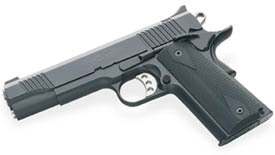 It has fed and grouped wonderfully from the day I bought it new to replace a COLT Officers Model that gave me nothing but trouble. I reload range brass, so I have some feeding problems – but I can honestly say that with the Compact, all the problems can be traced to my reloads. Stainless Gold Match (1999) – around 1K rounds. As you can see this one is brand new. It groups wonderfully, and feeds everything but by reloading mistakes (see above). As you can see, I keep buying Kimbers. There must be something to them that makes it worth working through the early feeding problems. My experience has been very good on later product.